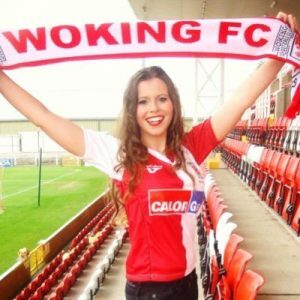 A FAKE social media account set up in a fervent Woking Football Club supporter’s name duped hundreds of people into believing it was genuine. Ellie Beagley was shocked to find that someone had stolen her identity to create a false Twitter handle. The account was opened on Monday last week and had gained 900 followers by the time it was suspended by Twitter on Saturday. “Whoever set it up was even holding private conversations with followers, including one of my nephews,” said Ellie, who runs the Sporty Kids children’s sports coaching and holiday activities company in Woking.